SEATTLE, Jan. 22, 2010 – Boeing [NYSE: BA] and Ethiopian Airlines today announced an order for 10 Next-Generation 737-800s. The order is valued at $767 million at list prices. 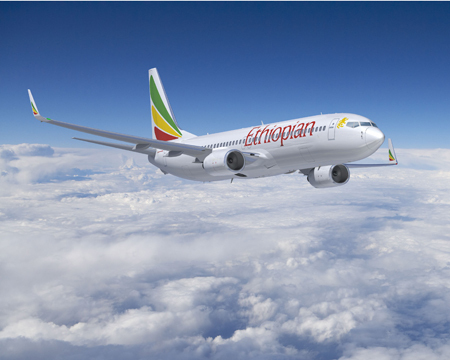 Based in Addis Ababa, Ethiopia, the carrier is investing in the additional airplanes to expand its fleet and broaden its network. "Since its founding in December 1945, Ethiopian Airlines has been a dedicated Boeing operator — from [the carrier’s] first flights using DC-3 propeller-driven airplanes between Addis Ababa and Cairo, to recent orders for the long haul 787s and 777-200LRs, and continuing now with 737-800s. Ethiopian Airlines has been among the most profitable airlines in the region and one of our most valued partners," said Marlin Dailey, vice president of Sales, Boeing Commercial Airplanes. In 2009, Ethiopian Airlines became the first African carrier to order and operate the ultra-long-range 777-200LR model. Ethiopian also was the first African carrier to order the 787 Dreamliner, ordering 10 in 2005. Ethiopian Airlines is an all-Boeing operator. With the exception of the 747, it has operated every heritage Boeing commercial airplane since the 707. The airline operates five 737-700s and two 737-800s. Ethiopian also operates nine 757s, 10 767s and one MD-11BCF (Boeing Converted Freighter), with a second MD-11BCF arriving in August.